Whether purpose-sunk as an artificial reef for scuba divers, or lost as the result of an accident, wrecks are fascinating windows to the past. Ships, airplanes and even cars are fascinating to explore and usually teem with aquatic life. Each wreck dive offers a chance for discovery, potentially unlocking a mystery or spying something others have missed. 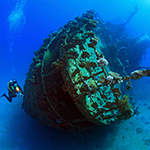 The Just Add Water Wreck Diver Specialty course is popular because it offers rewarding adventures while observing responsible wreck diving practices. Except as noted, classroom sessions take place either at our Willoughby or Fairview Park locations. You instructor wil discuss options for locally-conducted open water training dives. Weeknight classroom sessions typically run from 6:00 until 9:00. Please call for upcoming course dates. The course fee is $245 per person. Students are responsible for transportation, lodging, meals, dive site admission, and must supply the items listed below.